Georges Rouault, Parade, 1934, Oil, ink and gouache on canvas, 11 4/5 x 7 7/10 inches, Private Collection, © 2008 Artists Rights Society (ARS), New York/ ADAGP, Paris. The exhibition will comprise approximately 240 of Rouault’s finest paintings, works on paper and stained glass—many never before displayed in North America—drawn largely from the holdings in Paris of the Fondation Georges Rouault, the Centre Pompidou and the Musée d’Art Moderne de la Ville de Paris. Prominent American museums also will lend paintings (see below), and many of Rouault’s prints and books will be lent by the Boston Public Library. “Drawing largely on the unique resources of the Boston College faculty in multiple disciplines, the McMullen is pleased to offer this re-examination, and in several cases new interpretations, of Georges Rouault’s oeuvre in the most comprehensive exhibition of his work mounted in North America in several decades,” according to McMullen Museum Director and Professor of Art History Nancy Netzer. 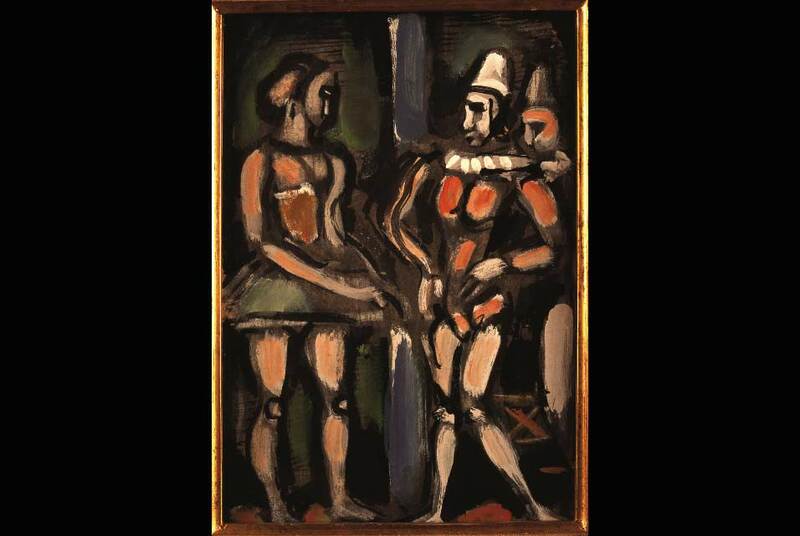 According to organizers, the exhibition will show viewers that the act of judgment is central in Rouault’s work: judicial figures must make their judgments based on limited appearances and not full knowledge. The innocence of criminals is frequently misjudged; the painted on joy of clowns and prostitutes (filles de joie) is an intentional misrepresentation that leads the audience to misjudge these tragicomic lives. Rouault explicitly used these figures as types for the dissimulation of human beings in general: “Who among us does not wear a mask?” he famously asks in one image reproduced several times. “Are we not slaves ... believing ourselves to be kings?” he asks in another. Schloesser explains: “Such dark reflections are redeemed for Rouault by the human masque’s qualifier—“mystic”—which points to the centrality of Christian iconography for the artist.” Arranged chronologically, the exhibition seeks to demonstrate that Rouault’s religious realism as it developed was far removed from any conventional piety. Rouault’s human comedy is simultaneously a divine comedy; it is a masque—but one that is ultimately mystic. Public Opening Celebration: August 31 On Sunday, August 31, the public is invited to join Boston College community members at an opening celebration, which is free of charge and will be held at the Museum from 7-9 p.m. The public opening will be followed by a black-tie opening for invited guests on September 5. Exhibition Organizers and Exhibition Lenders - Mystic Masque was made possible with the support of the Fondation Georges Rouault. Curated by Schloesser, this exhibition has been organized by the McMullen Museum of Art and underwritten by Boston College with major support from the Patrons of the McMullen Museum. Additional support has been provided by the Florence Gould Foundation and the LoSchiavo Chair, University of San Francisco. This exhibition is also supported by an indemnity from the federal Council on the Arts and Humanities. In addition to the French institutions, lenders to Mystic Masque include the Metropolitan Museum, Museum of Modern Art, Currier Museum, Saint Louis Art Museum, Philadelphia Museum of Art, Chrysler Museum of Art, Dumbarton Oaks, Museum of Fine Arts, Boston, Los Angeles County Museum of Art, Dallas Museum, Phillips Collection, and Dayton Art Institute. Accompanying Exhibition Catalogue - A fully-illustrated catalogue of approximately 450 pages, edited by Schloesser, will comprise more than 30 essays—discussing various themes and groups of objects—based on new research by scholars, many professors at Boston College, from a variety of disciplines, including Art History (Jody Blake, Naomi Blumberg, Claude Cernuschi, Stephan Dahme, Marie Garraut, Jeffery Howe, Soo Yun Kang, John McCoy, John Michalczyk, Tara Ward); Painting, (Gael Mooney); Sculpture and Aesthetics (Jean-Marie Tézé, SJ); History (Paul Breines, Sheila Nowinski, Virginia Reinburg, Mary Louise Roberts, David Quigley, Schloesser), Literature (Bernard Doering, Thomas Epstein, Susan Michalczyk); Philosophy (Anne Davenport, Nora Possenti Ghiglia), and Theology (Roberto Goizueta, James Keenan, SJ, Margaret Miles). McMullen Museum of Art The McMullen Museum is renowned for organizing interdisciplinary exhibitions that ask new questions and break new ground in the display and scholarship of the works on view. It serves as a dynamic educational resource for all of New England as well as the national and the international community. The Museum displays its notable permanent collection and mounts exhibitions of international scholarly importance from all periods and cultures of the history of art. In keeping with the University’s central teaching mission, the Museum’s exhibitions are accom-panied by scholarly catalogues and related public programs. The McMullen Museum of Art was named in 1996 by the late Boston College benefactor, trustee and art collector John J. McMullen. McMullen Museum Hours and Tours Admission to the McMullen Museum is free; it is handicapped accessible and open to the public. The Museum is located in Devlin Hall on BC’s Chestnut Hill campus, at 140 Common-wealth Avenue. During this exhibition, hours are: Monday through Friday, 11 a.m. to 4 p.m.; Saturday and Sunday from noon to 5 p.m. Closed on the following dates: September 1, October 13, November 27-28. Free group tours will be given every Sunday at 12:30 p.m. They also may be arranged upon request; call (617) 552-8587. For directions, parking and information on public programs, visit www.bc.edu/artmuseum or call (617) 552-8100. Georges Rouault: Recent Exhibitions - Public recognition of Rouault had largely gone into an eclipse since a 1971 centennial celebration of his birth, but 2006-2007 witnessed a revival of exhibitions of his work. The Musée d’Art Moderne de la Ville de Paris presented Rouault’s largely unknown work from the period of 1904-1920. A simultaneous exhibition at the Musée d’Art Moderne et Contemporaine of Strasbourg showed the artist’s graphic works and many painted works, including unfinished pieces from the Rouault installation in the newly renovated early-20th-century galleries at the Centre Pompidou. An installation at the Mitchell-Innes & Nash Gallery in Manhattan gave American viewers an opportunity to see Rouault in an entirely new light. Metropolitan Museum to Open on Labor Day "Met Holiday Monday"